Life in media buying is fast paced and chaotic. 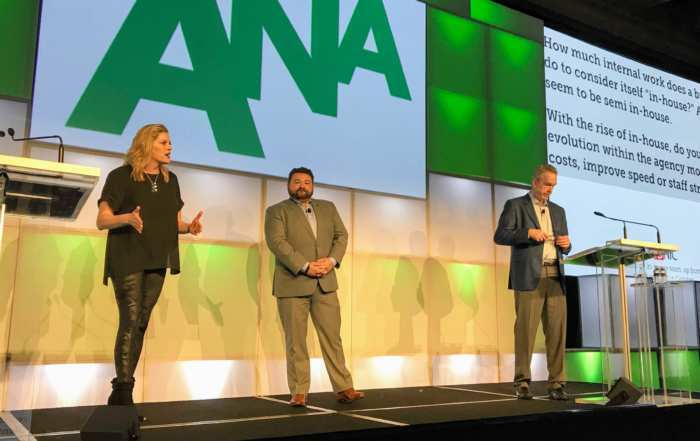 It’s no mystery why things fall through the cracks when you need to juggle vendor deadlines, synchronize your team’s workload, and ensure that creative, account services, media planners, and media buyers are all on the same page. The fallout from missed tasks can cost you money, clients, and even your job. This leads to many restless nights and panicked, late night phone calls to double check that the insertion order was sent and you trafficked the right spot. A study published in Harvard Business Review found that every team member knowing their own responsibilities is the single most important factor in successful strategy execution. Far more than organization charts, incentives, and other factors that tend to get the most attention from management. 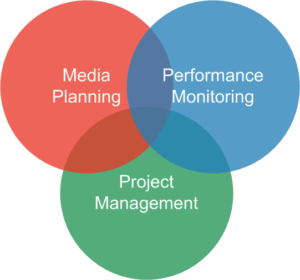 Media buying, like every strategy execution, requires good project management to succeed. Although not the most exciting topic, it’s business critical. The obvious solution to managing a mess of tasks is project management software. Unfortunately, introducing project management software in a busy advertising agency is as easy as herding cats while they’re being chased by dogs. You may have first hand experience of this. General purpose project management software solves the problem of task management, but it comes at the steep price of decreased efficiency. Nobody has the time to log in to yet another system to enter to-do lists and keep every task up-to-date. Meanwhile, management is constantly cracking the whip to get everyone to use the system. It’s completely exhausting to both management and staff. This is why most project management software implementations fail at advertising agencies. It’s almost impossible to gain universal adoption. What started as a great concept, inevitably ends up as a ghost town of sporadically maintained task lists. Since you’re never confident it’s up-to-date, you’re back to square one with no reliable project management system after a painful roll out failure. 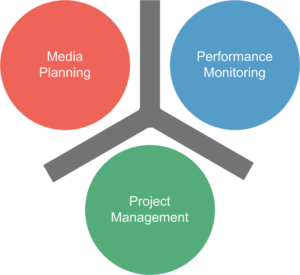 What you really need is a project management tool that integrates with the media process. No separate login. No special training. You need project management software that understands your job: media authorizations, insertion orders, gathering creative, trafficking, sending tags, reporting, and the rest of the 42 steps in the media buying process. 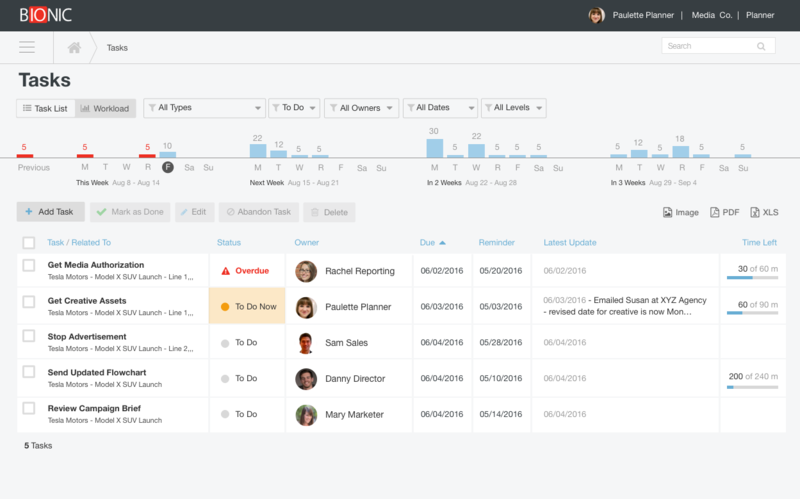 Bionic takes a fresh approach to project management software. 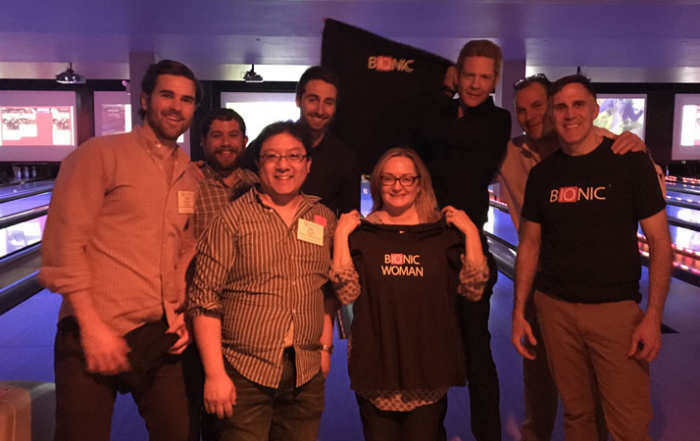 Bionic understands what it takes to execute a successful media plan. Project management should fit seamlessly into your hectic workflow. 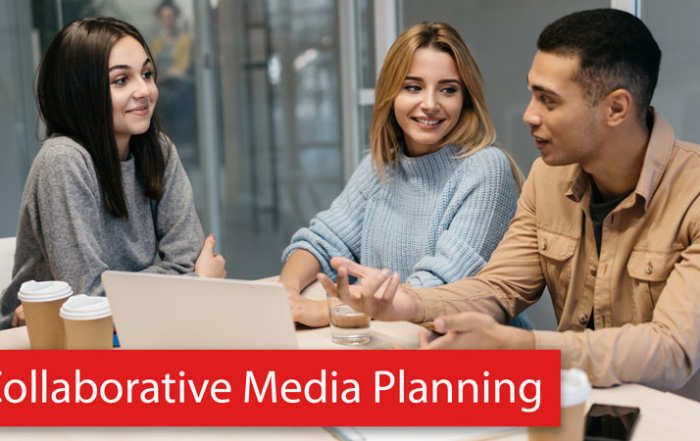 It needs to turn an organizational nightmare into an easy to manage, organic piece of the media planning and buying process. Start every day with a solid game plan with To Do Now lists. Always know what is a priority with the most urgent tasks automatically populated on your dashboard. Now you can leave the office knowing you completed everything that needed to get done. To Do Now lists are delivered to your inbox every morning so you can get ready for the day before you step in the office. Rest easy knowing you will never again miss an important deadline. 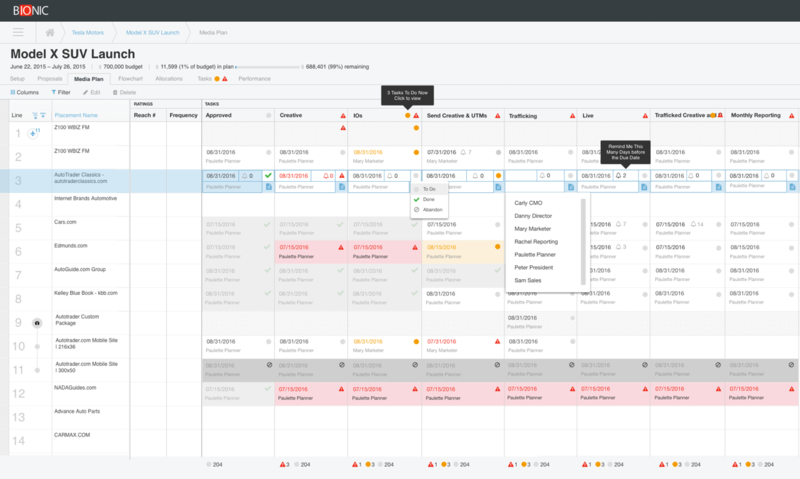 Bionic deadline monitoring is your hub for project management. Here you can review upcoming deliverables and the latest updates from the team. Click on an individual task to open a detailed view that includes description, status, and all notes and updates made throughout the life of the task. 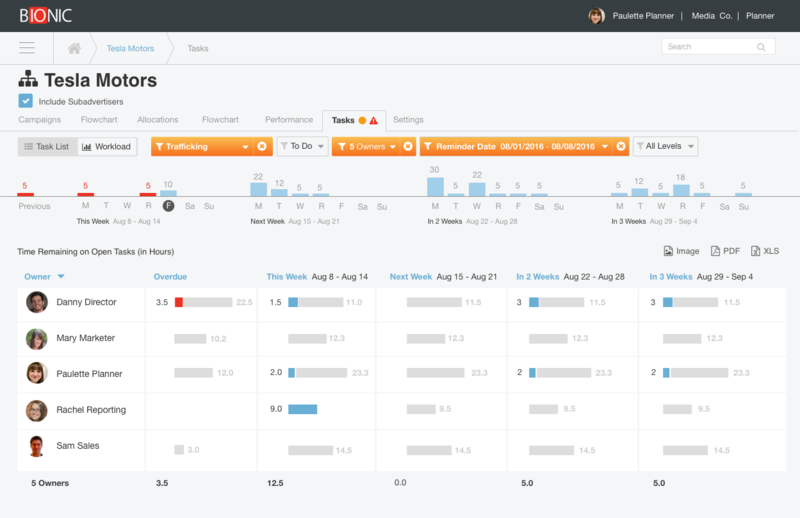 Task Radar gives an overview of upcoming and overdue tasks so you can predict and optimize. Walking the tightrope between optimizing bandwidth and overworking employees used to be a guessing game. 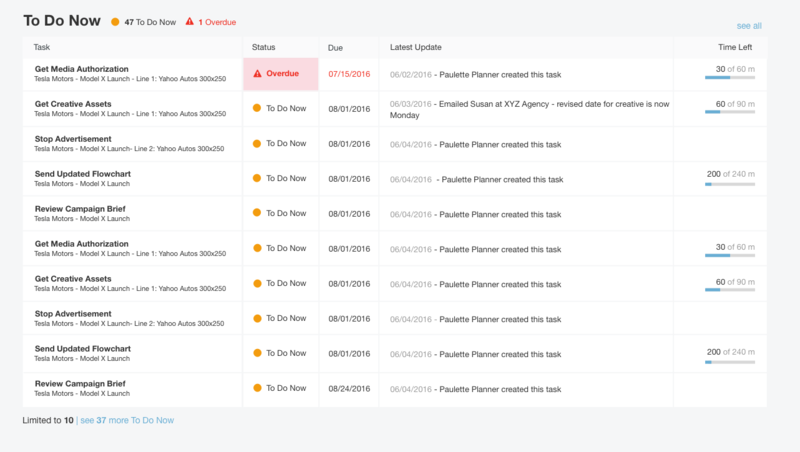 Bionic’s workload manager gives you the insight to ensure that each team member has just the right amount of work on their plate. Media plans are living processes with constantly evolving timelines. Workload manager shows you precisely how many hours of tasks each person is dealing with. Easily reallocate tasks and reorganize accounts to help divide and conquer plans and justify hiring more talent when everyone is tapped out. Jumping into a separate program to check and update tasks can throw you out of your groove. Bionic Project Management allows you to view, edit, and add tasks while you’re deep in your media planning and buying zone. Sort tasks at the campaign level to quickly determine who is handling creative, trafficking, insertion orders, and more on each campaign. All you need is an internet connection and a browser to get started on Bionic. There’s no complicated software to install. Bionic subscriptions include full access to the media planning, marketing performance monitoring, and project management software. Our team guides you through the onboarding process and assist you at every turn. 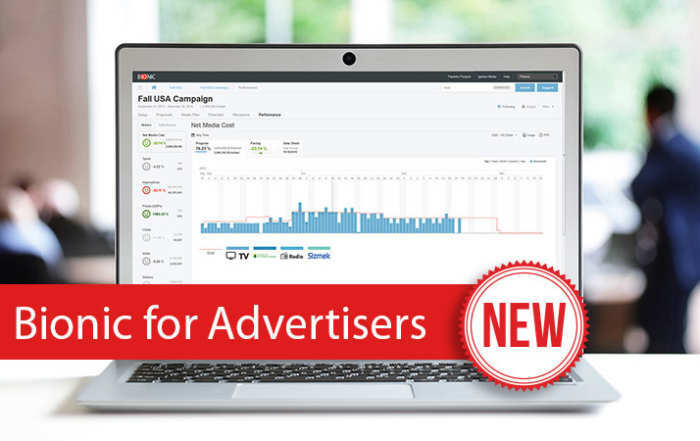 Most customers are successfully creating their first media plans in Bionic within 48 hours. Bionic comes with a 14-day money back guarantee. The no-nonsense terms and conditions means you can make adjustments any time.